There's someone coming to the island. It could be someone we already know (Desmond, Charles Widmore, Aaron, Ji Yeon), or it could be someone new that we've never seen before (LOST certainly isn't afraid to introduce new characters to us regardless of how many episodes we have left in the show, as was evidenced by the season premiere). We don't know who it is, and we don't know their purpose. What we do know, is that Jacob knows they're coming, and wants to help ensure that they manage to get to the island. So he enlists Hurley to help him, only how Hurley is supposed to help isn't totally clear at this point in time. Hurley took Jack to the light house, per Jacob's instructions, which led to Jack realizing that Jacob has been watching Jack his entire life, and also led to a broken light house. So, perhaps the mirrors in the light house were supposed to be destroyed, rendering it useless, or perhaps it's deeper than that. Maybe Jack is the one that is supposed to help get this someone to the island, and this was all part of a greater plan by Jacob to get Jack on board. After all, we don't know how this someone is getting to the island, it may not necessarily be by boat. For me, this was the most intriguing bit of information that we learned in this week's episode. Actually, this week reminded me a lot of last week, where we're given a good amount of information, but we don't necessarily know what to do with that information yet, but eventually it will be revealed, and we'll have all this backstory to piece everything together. For comparison's sake, it reminds me of how they handled Season 5 at times. The season premiere last year opened with a clip of Dr. Chang and Daniel Faraday in 1977, the day of the Incident. Now, did we know any of that at the time? Of course not. We knew who Dr. Chang was, we knew who Daniel was, but that's about it. We had know idea about the island moving through time, no idea about the Incident (aside from vague mentionings of it on the Dharma training videos), but as the season went on, it all eventually made sense. I'm expecting more of the same this season, based on what we've seen so far. For those of you getting frustrated, my advice would be to let it play out. I do feel like they're giving us information, giving us answers, I just don't think we have enough of the puzzle pieces yet to see the whole picture. But they're definitely giving us pieces to work with, so it's only a matter of time. While we're on the topic of LOST's story-telling choices, I wanted to mention an interesting theory that I heard on a couple of podcasts this week regarding the flash-sideways. As I mentioned, the writers really like giving us information before we know what to do with it, or before we can see the complete picture. Season 1, we spent the entire season seeing flashbacks of the survivors getting to the airport, and getting on the airplane, and then finally at the end of the season we saw something close to a complete picture, of everyone on the flight, together. As I mentioned earlier, we saw this several times in Season 5, showing us things that hadn't happened yet, with the clip from 1977, showing the Oceanic 6 back on the island before we had even known how they were planning on getting back to the island. Even the biggest shock of the season finale in Season 3, showing us our first ever flash-forward, revealing that not only did Kate and Jack get off the island, but Jack wanted to go back to the island, when in present day everyone was still on the island, and Jack had just made contact with someone on the freighter off the coast. So clearly this is a often-used tactic by the writers. Well, what if something similar is happening with the flash-sideways we've been seeing? What if this is the future of the people on the island, only we just don't know it yet? Damon and Carlton have been very adamant about telling us that they don't like calling this storyline an "alternate timeline," because it's just as integral to the plot as the on-island storyline. But that's all they'll give us, leaving us to try and figure out what it all means. Discussions I've had with people revolve around what this other storyline means, and a lot of people think that we're looking at two different storylines here, one where the Incident worked, and the plane lands, and one where it perhaps didn't work, and everyone went back to 2007, and nothing changed. I've always had problems swallowing this idea, because I just can't figure out a way where it makes sense in my head. This scenario of all of a sudden there being two parallel timelines on the show, I don't get that, because I don't understand the idea behind having a universe where the plane lands safely, and the island is underwater. How does that further the overall story that we're watching? When the LOST writers integrated time travel into the story, they did so with a purpose. The survivors went back to the 1950s and the 1970s because in the history of the island, that's what they were always supposed to do. I get that. Parallel universes? I don't get that. Because I don't see what you can do with that. While there are many similarities between the two, there are also many differences, and each seems to be following its own course. So what's the purpose behind something like that, to eventually merge the two universes? The off-island storyline, all the survivors realize what had happened to them in the other universe? The other universe course corrects itself so that the fates of the survivors is the same as it was supposed to be? None of that really rings true to me. But, what if there was no alternate timeline? What if everything we're watching is all a part of the same universe, the same reality? I don't mean this in a linear fashion, trying to imply that the Incident worked, and the plane landed safely, and yet somehow in 2007 everyone's on the island as if nothing changed. If there's anything we've learned, it's that life on the island does not have to be linear. Instead, think about the idea of the flash-sideways' showing us things that haven't happened yet. What if the flash-sideways are showing us the end of the show, only we don't know it yet. Think about this. We, as viewers, are invested in these characters. We want to know more about them, what they do with their lives, and most importantly, when the show is over, we want to know what happens to them. That would mean some kind of epilogue after the big series ending event occurs. This happens constantly on 24. At the end of the day, evil is thwarted, and the show spends 20-30 minutes wrapping up the lives of the characters, giving us a glimpse of what they'll be doing tomorrow, and the day after that, etc. It's one of those things that you want to see as a viewer, because you care about the characters. Well, how do you do that with a show like LOST? There are so many people on this show, with so many different stories, how do you wrap all of that up? Why not spread out the epilogue, over the course of the entire season, so that you are able to see enough of everyone's lives to know how things turn out for them. Because the alternative, trying to cram everything in at the end of the series finale, it just wouldn't do these characters justice. So what does that mean? These flash-sideways are taking place in 2004, our on-island storyline is in 2007. Fair enough. But we still don't know what the end game is going to involve on this island. We do know that the island is uniquely situated in time, and actually has many unique properties, so if, say, the island were to be destroyed (or if important people on the island were to be destroyed), we have no idea what that would mean for everyone and everything everywhere else. What if this moment that the series is building up to, for whatever reason, results in the island under water, and as a result, has all of these other effects on everyone's lives that we are seeing in these flash-sideways. So these flash-sideways are simply showing us the world after this war, this battle, that we've been hearing about for so long. They are our epilogue, the happy ending that we've wanted for all of our characters. Now, this is simply an idea that I heard thrown out there. I think it's just as likely that the show ends with, say, Jack and Locke sitting on the beach talking about progress (and personally I think that would be all kinds of awesome). But as far as explaining what purpose the flash-sideways serve, that's by far my favorite theory that I've heard so far, and I haven't really seen anything so far that would imply that it's not true. -"We'll get that cleaned up. If there's one thing that'll kill you around here it's infection." Great, great line by Claire. Her casual delivery was perfect. -Speaking of Claire, she's...um, really gone off the deep end there, eh? I had a feeling that when Jin took looked in that crib that there would be some makeshift baby in there, but using an animal skull as the head? That's just special. I think Rousseau would even call Claire crazy. Yikes. Don't underestimate her, though, putting an ax through a guy's chest is no small feat. -Jin looked slightly terrified there, wouldn't you say? He was fine with saying absolutely anything that he thought would get him the hell out of there and away from crazy Claire. I will say, after rewatching some old episodes, that if Jin and Sun do not get their on-island reunion before one of them dies or gets infected or whatever, I'm going to be very pissed off. You hear that Locke? Don't screw this up. -Kind of weird to be sans Ben for 2 of the last 3 episodes. Let's have less of that. Thanks. -Of course Hurley and Miles are playing Tic-Tac-Toe. I have no doubt that it was Hurley's idea, and I have no doubt that Miles thought it was a dumb idea because Tic-Tac-Toe stops being fun once you realize that you will just have tie after tie after tie after tie unless you play someone who doesn't know proper strategy. Seriously, can we spin these two off once LOST is over? -On a side note, I was watching the beginning of Rush Hour over the weekend, and during the opening credits I saw Ken Leung's name, but I didn't think much of it. Then, I see the main antagonist, and thought he looked a little like Miles, which was odd, because this character, Sang, is straight out of China, and is pretty well versed in the martial arts. This is pretty contrasting with the character of Miles Straume. But, I looked it up on IMDB, and sure enough, that's him, shaved blond hair and all. I guess the last time I saw that movie was before Miles ever showed up on LOST. -Did anyone notice anything at David's mother's house that would tell us who his mother is? I didn't notice anything, but I was just curious if it was Sarah, or someone else. -I've always appreciated Jack's sensitivity towards others. Five minutes after he tells Sayid the reason the Others are looking at him weird, he goes with Hurley to leave the Temple, leaving Sayid there by himself with a bunch of people that recently tried to kill him. Way to go Jack. -I thought the throw back to Season 1 was really well done. Shannon's inhaler, the caves, all great stuff. I especially loved Hurley's line about completely forgetting about Adam and Eve, which I have to think is a bit of a joke towards LOST's obsessive viewers who have been talking about Adam & Eve ever since we first saw them. 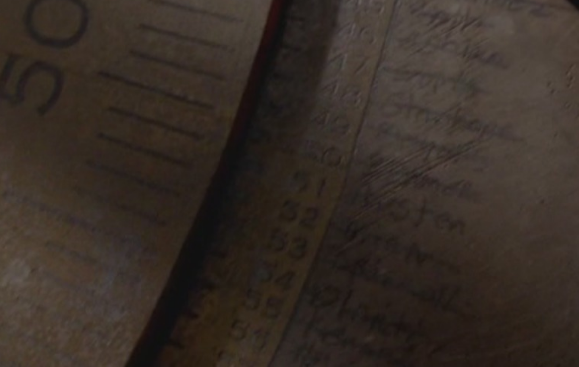 -Per Lostpedia, Kate Austen is number 51, and is not crossed out. I don't know what that means, but there you go. -Something I thought about the names and numbers was that they were all listed in a completely separate place on the island, and this time in numerical fashion. I assume that there are 360 of them, no more, no less. I heard some speculation last week about whether the names in the cave were really written by Jacob, or if it was actually the Nemesis' cave, and he wrote them. I think it's a much more intriguing idea now that we see all of the names written somewhere else, in a much more orderly fashion, and in a "light" house, no less. -I thought the fact that Sawyer wasn't with the Nemesis was a little concerning, especially after the Nemesis said that to leave the island they would have to do it "together." -With the imminent arrival of the Nemesis to the Temple (according to Jacob), I wonder what that means for Kate, and if we'll see anyone else crossed off the list soon. -ABC really blows at these previews for next week's episode, I must say. For those that didn't see, I won't spoil anything, but needless to say, they did this lame thing about how next week's episode was so big they could only show a few seconds in the trailer. So stupid. Alright, that's all I've got for this week. As always, thanks for reading.